Base of Operations: Planet Uzalek, home of the Mordles. Also Toyfinity.com. History: the journey to Toyfinity started for John Kent as it did for so many kids of the 70s – with Star Wars. Over the years, he collected the big lines – Joe, Transformers, MOTU – and the obscure – such as Rocks and Bugs and Things (RBT), Roadblasters, and Wheeled Warriors. After closing the only officially-endorsed site about RBT on the Internet, John formed Toyfinity.com with Charlie Parry to help people see the connective tissues that run through every toy since Barbie. Moderator of the Glyos forum on October Toys and Producer of three full-length films (including the currently filming APOCALYPSE KISS), Doc Kent fights to bring information and entertainment to the people and propagate the legacy of Robo Force and Mordles! 1.) Let’s start with the obvious question: why bring back Robo Force? I’m a life-long toy fan. I’ve collect many of the 1980s lines and a bunch from other time periods. Generally, I’ve always gravitated towards space and robots as themes in my interests. I have a near-complete collection of Lego Space, tons of Microman, had a near-complete Transformers collection at one point…there’s something about a great robot that is just appealing to me. I prefer it when we’re exploring something not totally grounded in reality. We’re both lucky and cursed that we grew up in the 1980s. We were probably the first generation to be so extensively marketed to – cartoons, cereal, comics, lifestyle items…I’ve thought about things from my childhood almost every day of my life, and that speaks to the effectiveness of the marketing. I can rattle off the real names of certain G.I. Joe [characters] easier than I can remember most birthdays. As such, these things permeate my mental space. What can easily be said about many lines in the ’80s is that they died horrible deaths. Robo Force is a fun toyline! Ideal/CBS certainly thought it was going to do well, based on the fact that I’m still finding new lifestyle items with Maxx on them – the most recent being roller skates. But the toy shelves did not exist in a vacuum. Competition is brutal. You have many of the great toy lines of all-time on shelf at the same time as Robo Force – Super Powers, Gi Joe, Transformers, MOTU, Rocks and Bugs and Things (for me, anyway)…if you move Maxx Steele [the hero of Robo Force] a few years forward or a few years back, we might be having an entirely different conversation. Truthfully, most lines fail. You’ve got one year to get an audience or it’s over. Even when there is failure, that does not mean the death of those characters. Star Trek is an obvious example – dedicated fans helped make Paramount aware that they wanted it back, and we’re here talking about Star Trek decades later. Not that I’m comparing Robo Force fandom to Star Trek. People either fondly remember Maxx or they think that the selling points of the original figures were ridiculous. I think the design of Maxx himself (and Hun-Dred) is fantastic. He had the potential to be a lot larger than what fate determined for him. The execution hampered things. You have the character of this robot who is ready for “any mission, any place, any time” – and what you get is a figure with a giant suction cup and hugging power action, with robot names written on the bodies as a throwback to Zeroids. There’s a miscalculation somewhere in there. Don’t get me wrong – the original figures are a lot of fun. I enjoy the suction cup and squeeze-y arms. Many collectors today appreciate the designs, but kids couldn’t be 100% invested in the gimmicks they used to sell the line originally. Why bring Robo Force back? When I found out that the rights were available, I asked myself the same question. I completed my Robo Force collection in the last couple years because I enjoyed the robots so much. As we’ll discuss, the story of things is super-important to me. Maxx was never given a proper chance to shine, in my eyes. There is a much greater story to be told with Maxx – and unfinished business when it comes to the prototype characters – that we’d never see if the major toy companies held the rights to Robo Force. Maxx would be in a vault somewhere alongside the Inhumanoids and Air Raiders. I’m bringing Maxx (and the Mordles) back because it’s something that I want to see happen. How many times do we get the chance to continue the story of something we personally loved from childhood? 2.) Did you collect Robo Force as a kid? What do you think was so appealing about the vintage figures? I had some Robo Force as a kid. Definitely Maxx and Blazer. Possibly Coptor. As a kid, you had only a limited amount of purchasing power, and it usually came down to whatever was interesting you the most at the time. I can trace back what my brother and I were into by the figures we bought. It was usually G.I. Joe, to be honest. I finished the Robo Force collection in the last couple years. The appeal of Robo Force: the vintage figures are giant, chunky robots. What more does one need? They play well with G.I. Joe and other lines, even if you don’t care who Maxx is. I think that once a collector has a thousand Transformers, their mind has a tendency to wander in other directions. So you go where your proclivities take you – I see a lot of appreciation for Robo Force around the Internet. There’s something to be said for an item that’s just a solid toy. That’s one of the philosophies of this project – I’m not going to make a toy that I wouldn’t purchase personally. The first shelf that will have the new Mordles and Robo Force on it will be mine! 3.) What’s the story behind bringing it back? Was it difficult to track down the license? Did you get in touch with anyone who worked on the original toys? To tell you the story of Robo Force’s return, we have to look back in time a bit. For me, the STORY has always been as important as the toys themselves. I love Computer Warriors and Roadblasters, but there isn’t a lot of story there. G.I. Joe might be the greatest figure line of all time, but what cemented it into my psyche forever was comics like Issue 21 in the Marvel run, or the horrors of war storyline where SAW Viper snuffed out a bunch of Joes. I can’t say I always thought I wanted to make toys, but I did want to make movies and tell stories. Besides, how would one go about getting a toyline made in 1995? It wouldn’t be possible, as Drastic Plastic proved with the HARD CORPS. Part of my journey was really feeling compelled to make a website about toys in the early 2000s. But even at that time, it seemed like all the lines which I had a lot of knowledge in were covered. There were even sites on Inhumanoids and Visionaries at that time. Everything I did a search for would yield a result of some type. So I looked around at the different toys on my shelves at that time and Rocks, Bugs and Things jumped out at me. There were no sites for RBT on the Internet, at all. So I opened up the first site completely dedicated to RBT. I’ve always tried to attack my quest for information from a reporting standpoint – where can we get facts? I knew from years of Tomart’s that Toy Fair catalogs sometimes held information on items that were never released to the public. So I needed to get the Ideal catalog featuring RBT for my collection. When I finally obtained the catalog from 1985, I was stunned to find that there was an entire series of Robo Force that was never produced. 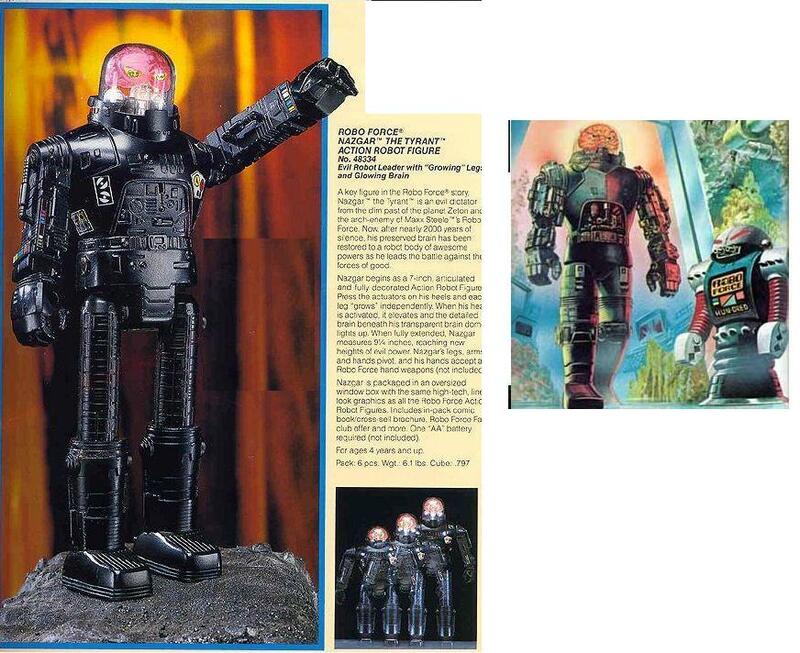 I believe I had the first scans of them on the Internet as part of my ‘Toy Clearinghouse’ website. Over the years, I had been contacted by (or found) people that worked at Ideal during that time. One of them was the actual inventor of RBT, Ralph K. (who has sadly passed on). I asked him about RBT and the rights, and he didn’t have any info on who currently owned the rights. I held out slim hope that I would eventually be able to get the rights to RBT, but it didn’t seem possible. A number of years ago, I found out about a new independent toyline called Glyos, run by a person I knew from collecting Microman named Matt Doughty. This was one piece of the puzzle – independent production was possible, just improbable as many others have discovered. It was a pleasure to meet him and talk about the dream of making my own toys. I was developing my own original concept – which you may still see someday as part of this project – to make over the last few years. In 2012, I had finally arranged the financing to pull this project off and something unexpected occurred. As exclusively documented on Toyfinity.com, a Robo Force fan found a example on eBay of the unproduced Robo Force figure, Tiltor the Changer. I was asked to be on the Roboplastic Apocalypse podcast to talk about this figure due to my past association with Robo Force and strange toys, and I was really aggravated that I had somehow missed out on this figure – as it turned out, because my autosearch for Robo Force had somehow gone into my spam folder that week. But Tiltor was actually the key to finding out who had the rights at that time. Through some Internet research and calls to friends, I came across a picture of the original design schematics for Tiltor, which led me to the rights holder who had been sitting on Robo Force for the last few decades. As far as talking to Ideal employees, I have corresponded with a number of them over the years. While looking for the rights, I contacted anyone who I could find who worked for Ideal/CBS Toys. I’ve corresponded with the people who worked on the commercials, the copy manager for the lines at that time, and a number of other people. It wasn’t something that people remembered fondly – the company essentially folded at the time when these figures were being created. 4.) Robo Force had some very cool prototype characters that were never made. Any plans to incorporate them into the line in the future? Oh, absolutely. I consider this line a failure if we don’t get a Nazgar to the fans, finally, in the correct scale (though it would be different from the original design in the Ideal catalog). 5.) What can you tell us about your plans for the new line? The plans I have for Robo Force are fairly ambitious. As I mentioned before, the story is one of the most important aspects to me of a toyline. Once I was over the initial shock of obtaining these rights, I had to figure out just what the story of Maxx and the Force was. In conjunction with Matt Doughty, a new storyline for Maxx has been developed that I hope people find interesting. I really can’t thank Matt enough for all of his help with this project. Without his support, it wouldn’t be possible to bring any of these properties back to collectors. The toys are an outgrowth of that story line. There’s a number of new enemies that Maxx will have to overcome that he’s never faced before, in addition to Nazgar and his followers. Much as Glyos does, you will see blurbs on the story on websites in the Toyfinity network (www.theroboforce.com and www.themordles.com) for these lines, as well as in a comic book-style story featured on those sites. I’m hoping to announce the artists soon on these strips, as well as when you might expect to see the first parts of the story. For now, what you’ll see here and there is something called “Visions of Robo Force”, where guest artists give their takes on the classic Robo Force designs. 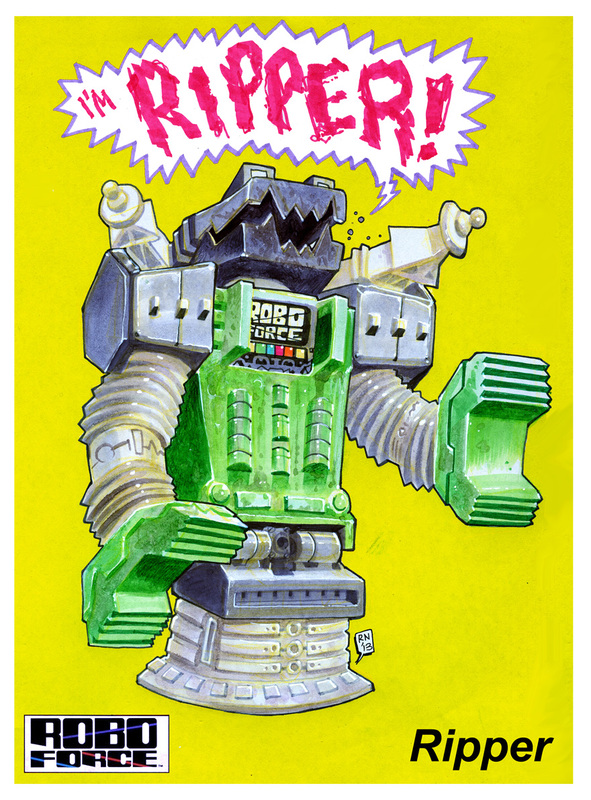 Included here, for the first time, is a piece by Ralph Niese of the Robo Force’s Ripper the Anti-Robot! One of the realities of independent production is knowing that there are only certain things you’ll be able to do. I run into this on my movies as well. I can’t make the original line again, exactly as it was. The costs to do so would be astronomical. The new figures will be much in line with items produced that have used the Glyos System. I personally enjoy the system – it’s a small bit of genius to find a way to make all of these pieces interact with each other in the way that Matt has – and that is how I want to present these items.You’ll see a mix of smaller PVC figures and larger vinyl items as time goes on. The figures will be in a good scale to interact with existing characters that use the Glyos System joints, and I expect them to have full interchangeability with all existing Glyos products. The characters have been updated with new designs, to some extent…as soon as there is a prototype finished and the tooling costs determined, the new Maxx will be revealed to the public. I want people to be excited, but I also don’t want to mislead anyone with a prototype that could change. People are really tired of being promised things and then getting something else, right? I think it’s important to be as honest as possible in an industry where you sign NDAs about what things cost. If things go as currently planned, you’ll see a product from Mordles available in the next few months, and the first of the Robo Force characters this year. The line will start with Maxx and Hun-Dred, in their correct colors. As soon as I have a final tooling quote, you’ll be shown the product. I know that when collectors hear that something is coming back, they imagine this massive flood of product. But I want to make sure people know that there isn’t going to be fifty releases in this line during 2013. We’re really in a great time where you don’t need to rely on a corporation to force-feed you content. If you like these characters and how they are executed, it is completely up to you how far we go with it. I’d love to be able to make Maxx, his new associate that will be revealed in the first Robo Force comic, Nazgar, the entire cast of characters, vehicles, playsets – small Mordles, giant Mordles – and things for these characters to fight and interact with that you’ve never imagined before. It’s a chance to say that you want something different. And I hope that Maxx is looking for missions for years to come! This is the first I've heard of the Robo Force reboot. 3"-4" Glyos compatible Robo Force figures would be freaking awesome. I will be watching this project very closely. I hope this line is successful enough that we can get a Nazgar figure, that looks like it would be a cool toy. Nazgar is gonna be one sweet, sweet figure!! I'm immensely happy at seeing Doctorkent accomplishing all of this. Good job! I am 100% down for these. I loved collecting Robo Force back in the day. I loved them when I was a kid. Perfect enemies for the Super Powers, GIJOE, and Star Wars. But please, please. Please don't be hipster/speculator bait and make limited edition, super expensive, timed drops, than only the most obsessed, trust-fund enabled can afford to own. *Give actual kids and fans a chance to own the toys, make them available throughout the year, 24/7. * Kids will eat them up. My buddy's kids loved the big box of Robo-Force I gave them ten years ago. I could see these toys being a really cool gift to give kids, just like how they love the Outer Space Men… when they're given a chance. I tried for several years to get a few Gyloss figures for myself and the little lego loving ones in my life, but the ones I wanted to get, always, always, "sold out" in five seconds, and then always appeared en mass within hours on October Toys forum or eBay, for triple or quadruple the price. I would love to support an indie toymaker, just without the whole lame "limited edition" predatory rush/panic hipster crap that permeates this hobby the last five, ten years or so. The small companies don't limit their runs to be "hip" or "cool" in most instances. What's happening is cash flow and the realities of running a small business. Every unsold toy sitting there is cash the company does without. In a perfect world they would have exactly enough toys for everyone who wants one.